c) walk there, in mid-heels. That is my challenge for the evening. As is putting kids to bed without yelling too much. The baby (who, for the record, is Officially No Longer a Baby but a Noisy Tantruming Toddler who can say ‘hello’ in four languages) is fond of getting out of his big boy bed and going into the toilet and playing with the toilet brush. His most wicked effort yet has been to come out into the lounge and surprise his dad with a swift and hearty thrust of said toilet brush into Mark’s forehead. It was funny, after. So Mark is off doing some Man’s Work and I am puffily here, fully embracing the Christmas DVD’s that my mum and dad sent the kids for Christmas (arrived today, thanks Royal Mail for your efficiency). 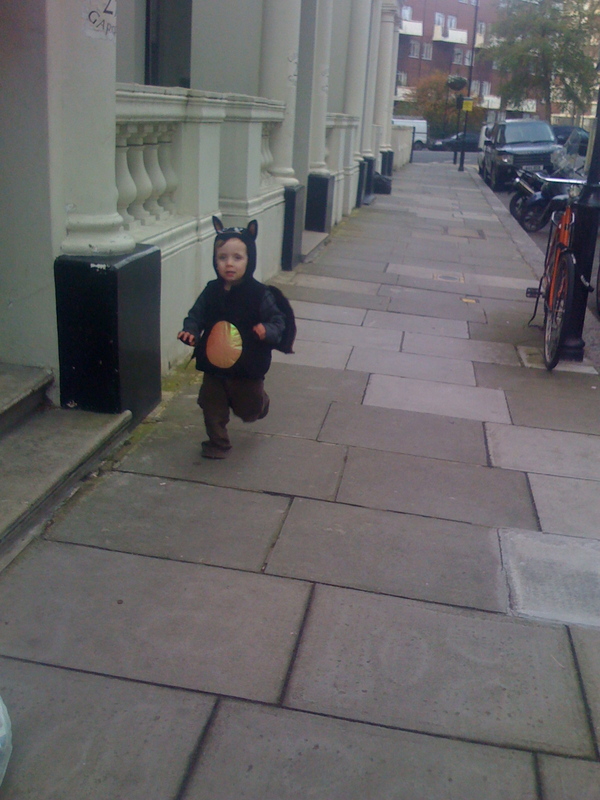 Here is a Noah Bat running along our street. Apparently, in September, my Noah Bat is going to be going to school. This news reached me today, and I feel quite good and quite sick about it, all at the same time. There may be some real benefits in having your children one after the other in manner of members of religious sect. In other news, I have found a lovely mink coat at the second-hand shop. It is excellent, definitely fierce, slightly mental-old-lady with white face powder and odd-urine smell, but it could be the way forward. But it is £125. Not chump change, fellas. And this is all on the back of the Browns sale, which was completely insane – they chucked out a lot of stock for £100 – my new Kinder jacket, for example, was once for sale at the marvellously OTT price of £925 – now hanging in my wardrobe for £100, which is like, 85% less or sommat (maths fails me routinely). The fact that it is dip-dyed fluoro yellow and grey tweed is a blog topic for another day, however. Right, I have to go get some children clean. Onwards and upwards! New bursts of energy from nearly due pregnant woman………keep us posted. It’s great when you push bits in and they come back out somewhere else. So not long then! Wow – you sound like you are getting ready to have this baby soon! I think our family gets looked at like we are from some weird religious sect… hey wait… we are! Just kidding. One of my kids loved playing with the toilet brust – but the worst moment was when I found them cleaning their duvet on the bed with it… poor Mark!